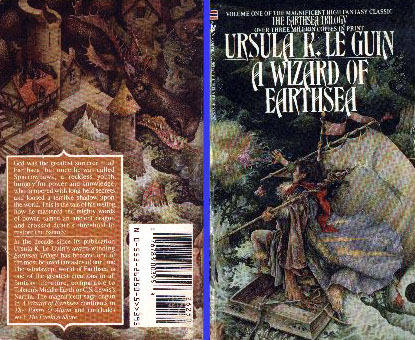 A Wizard of Earthsea: Boston Globe-Horn Book Award in 1969. 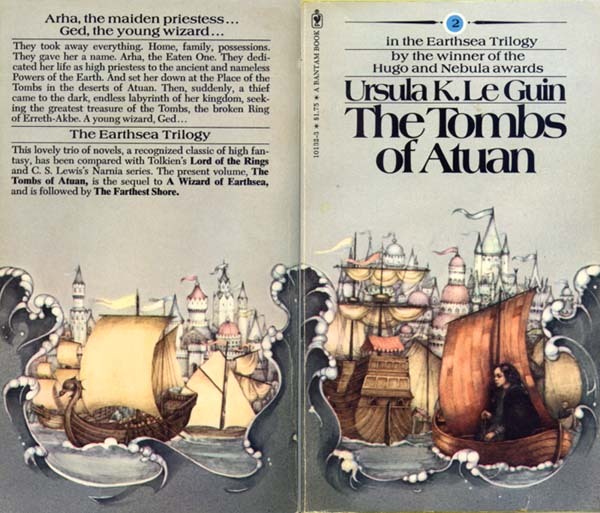 The Tombs of Atuan: finalist for the National Book Award for Children's Literature in 1972, nominee for 1972 Mythopoeic Award. 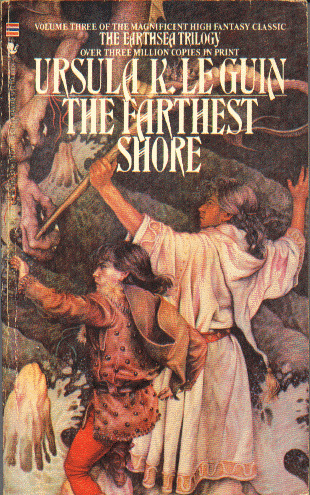 The Farthest Shore: 1973 National Book Award, nominee for 1973 Mythopoeic Award. 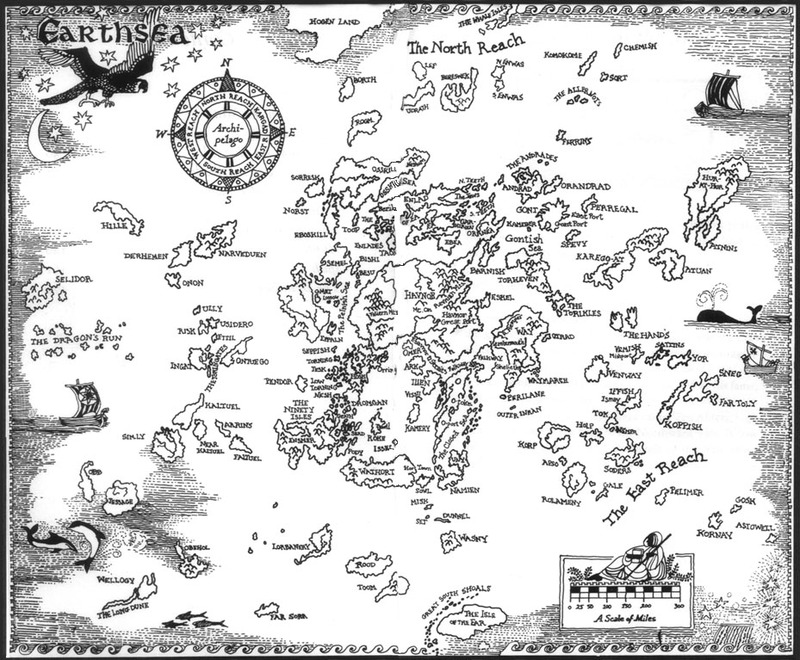 Earthsea is a world of mostly water, with most of the land being composed of many small islands in an archipelago with each island largely governing itself. 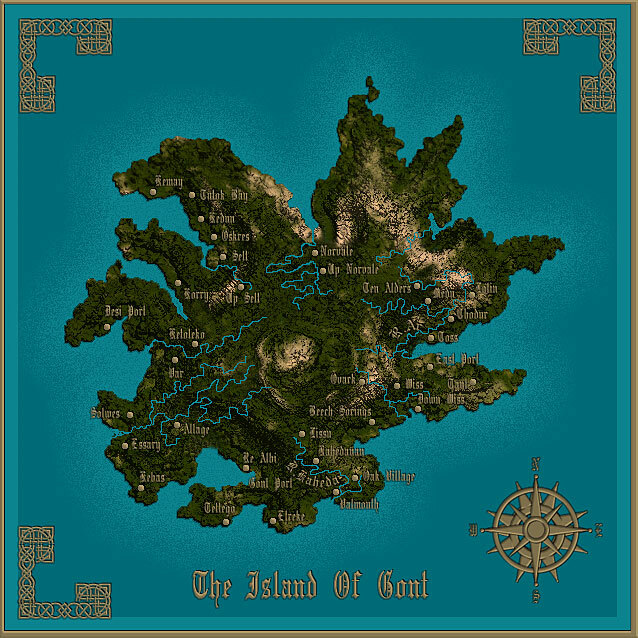 Magic is very important to most of the islands and mages are all trained on the island of Roke and then sent to those places where they are most needed. In the original series, all of the mages are male although there are many women and men outside of Roke with limited magical abilities. 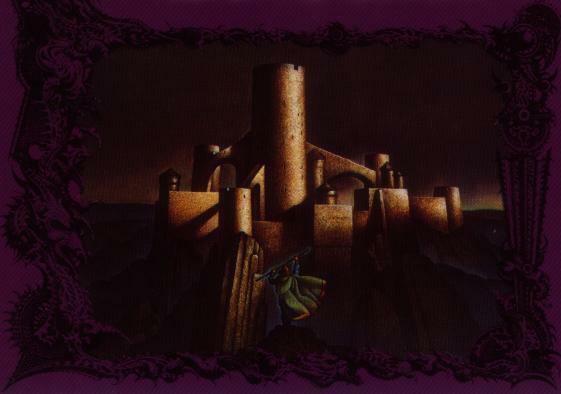 True Names have great power on Earthsea and are guarded with great care. Those who know your true name can command you. In fact, names are of such great importance that one of the primary elements of magical training is to learn the true names for as many things as possible. 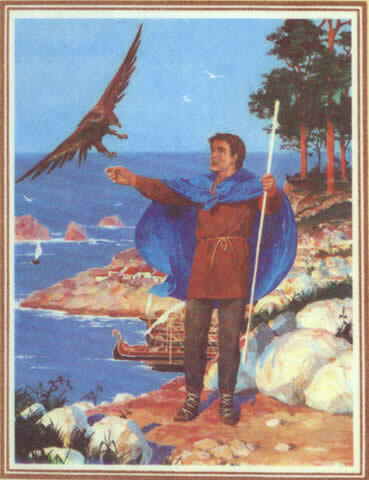 Sparrowhawk is the title character of A Wizard of Earthsea. He is born on the island of Gont in the village of Ten Alders and learns of his inborn magical strength at a young age defending the village against an attack. He ends up being apprenticed to Ogion the Silent, Master Wizard of Gont who also gives him his true name, Ged. The book is a coming of age tale telling of Sparrowhawk's growth to maturity and lessons learned along the way. 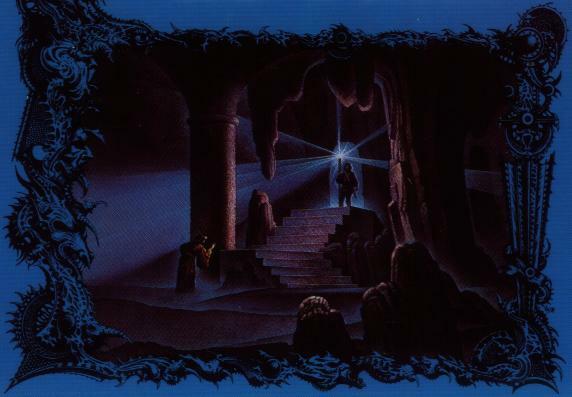 The Tombs of Atuan tells the tale of Tenar, One Priestess of the Tombs of Atuan. It too is a coming of age tale and a mature Ged, who is now a full mage, enters into it towards the end. 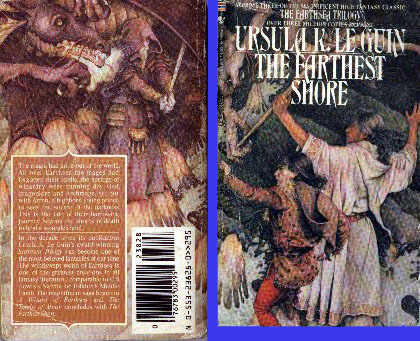 The Farthest Shore is the quest of Ged, now the Archmage of Roke, and Arren, Prince of Enlad, to save Earthsea and the magic of Earthsea by entering the land of the dead. They succeed, but at great cost to Ged. 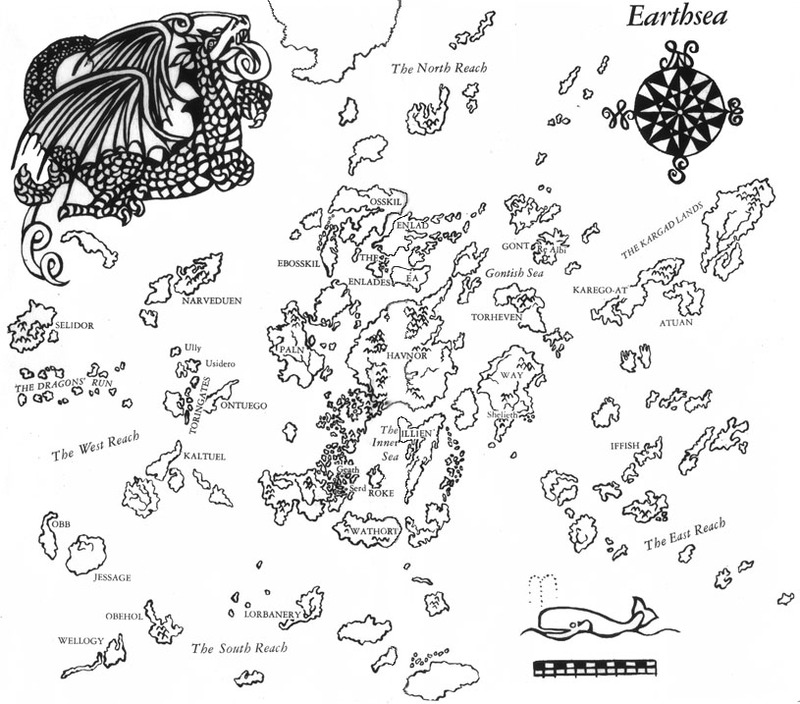 Written 18 years later, Tehanu: The Last Book of Earthsea, follows immediately upon the end of The Farthest Shore as Ged, bereft of his magical ability, returns to the island of Gont on which he was born and on which Tenar now lives. The first three books were primarily coming of age tales. Tehanu is a very different story of adults and grief and the problems of common people who have no magical powers and what strengths they can have that those in power never need. The Sci-Fi channel aired a 2-part, 4-hour miniseries based on the first two books in December, 2004. 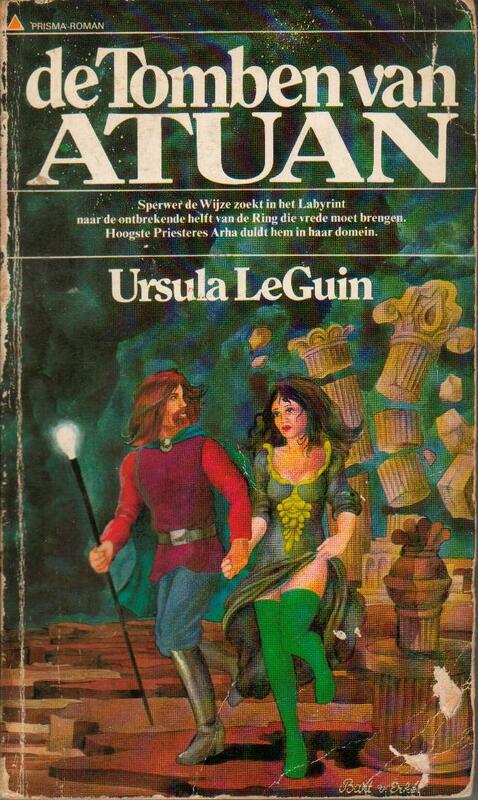 Both Ursula Le Guin and I have railed against it and I can not in any way recommend it. I had great troubles with the Lord of the Rings film adaptations but this is an absolute travesty against a wonderful piece of fantasy literature. 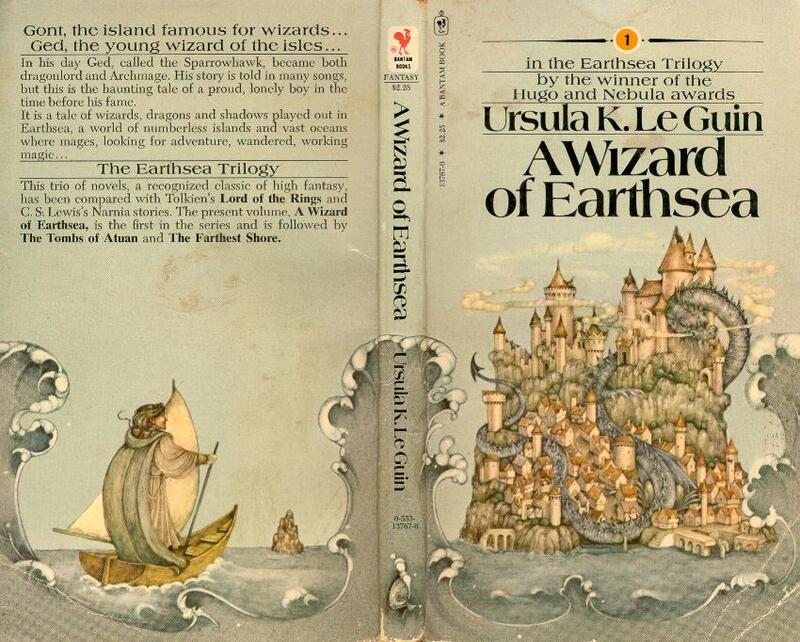 Small side images from A Wizard of Earthsea (Set 1 and Set 2) by Ruth Robbins, 1968. Cover images from Bantam books 1975 paperback editions (art by Pauline Ellison). Cover images from Bantam books recent paperback editions (art by John Jude Palencar (1991)). 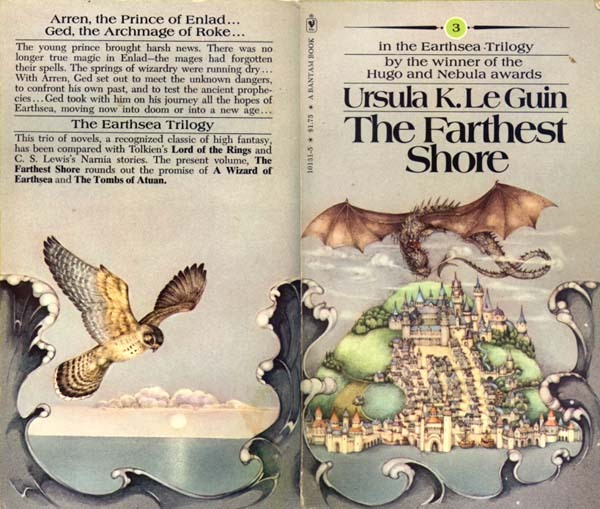 Cover images from earlier Bantam books editions (art by Yvonne Gilbert (1984)). 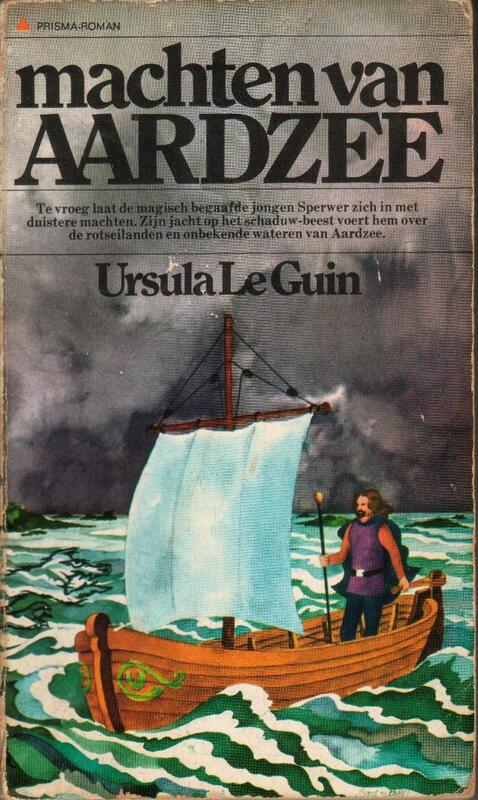 Cover images from Dutch editions (by Bart van Erkel). Cover images from 1992 Russian edition (by Denis Gordeev). 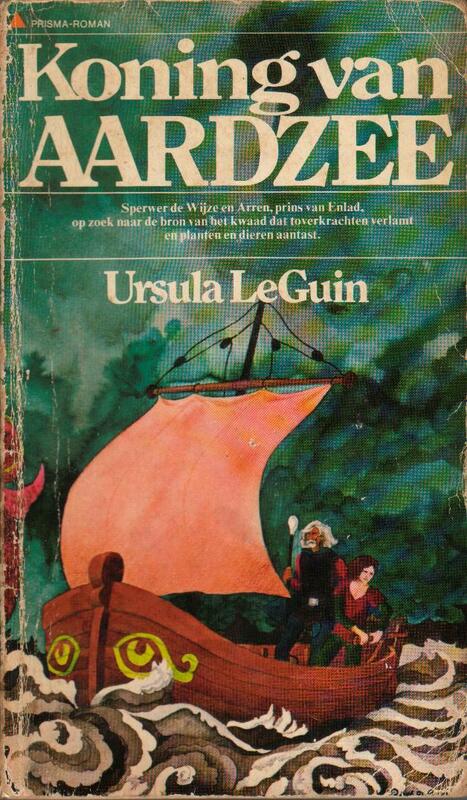 I don't know how old I was when I first read the Earthsea trilogy but it had as strong an effect on me as any other books I have ever read, particularly A Wizard of Earthsea. I identified with Sparrowhawk more than I have with any other character before or since and to this day use Sparrowhawk (or Ged) as my preferred alias on the net. His inner strength, talent, kindness and quietness all appealed to me. 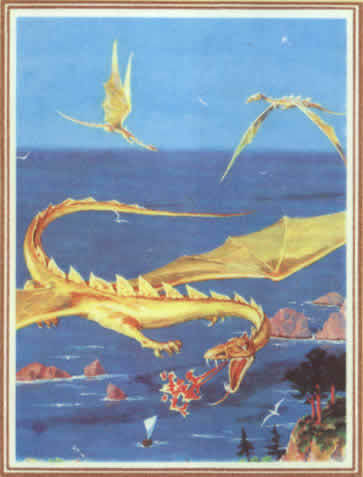 Earthsea also defined the concept of dragons for me. 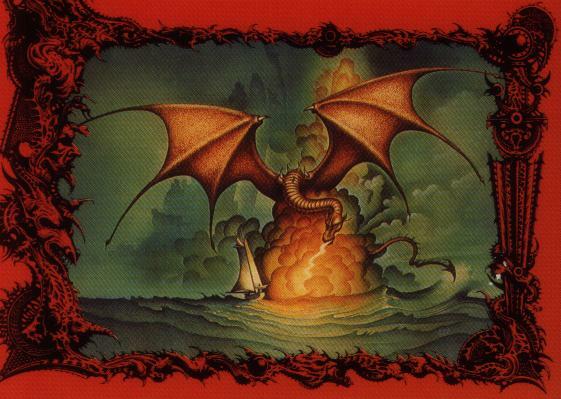 The dragons of Earthsea are wise, powerful, ancient, majestic and magical creatures who care little for the affairs of humans and others who live for such a short time. Only a very few humans, the dragonlords, are interesting enough that they are worth a dragon's effort to notice. These dragons are neither good nor evil; they are a race totally apart from man. This image is of Sparrowhawk in his Wizard's staff and cloak, with Otak, a small and rare creature who befriends him. When I use one, it is my signature image as Sparrowhawk. Ged describes the Otak thus: "They are small and sleek, with broad faces, and fur dark brown or brindle, and great bright eyes. Their teeth are cruel and their temper fierce, so they are not made pets of. They have no call or cry or any voice. .... He put it on his shoulder in the folds of his hood and there it rode. Sometimes during the day it jumped down and darted off into the woods, but it always came back to him, once with a woodmouse it had caught. He laughed and told it to eat the mouse, for he was fasting, this night being the Festival of Sunreturn."